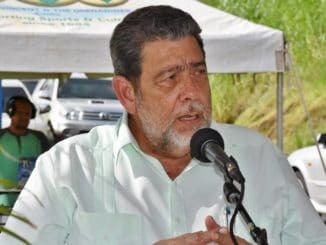 Prime Minister Dr. Ralph Gonsalves says Closed Circuit Television footage does not support the claim by a 70-year-old United States national that she was assaulted and groped in St. Vincent and the Grenadines capital, by two men of Middle Eastern descent. Dr. Gonsalves, flanked by Acting Commissioner of Police, Colin John, addressed the issue yesterday. The alleged incident led to the removal of 23 United States Peace Corps volunteers from St.Vincent and the Grenadines last month. Dr. Gonsalves and Commissioner John did not take questions from the media, saying that the investigation into the allegation is ongoing. The Prime Minister told reporters two officials from the Barbados-based United States Embassy are assisting with the investigation. Prime Minister Dr. Gonsalves said on August 20th , the un-named 70-year-old female Peace Corp volunteer alleged that she was assaulted near the bus terminal five days after arriving in the country. Dr. Gonsalves said following the alleged assault, he was advised that all the Peace Corps volunteers were sent to St. Lucia for an initial two-week period. The Acting Public Affairs Officer at the US Embassy, Gaïna Dávila, last month confirmed that the volunteers had been sent to St. Lucia, but said the action had nothing to do with the crime situation in St. Vincent.